The season of giving has arrived. 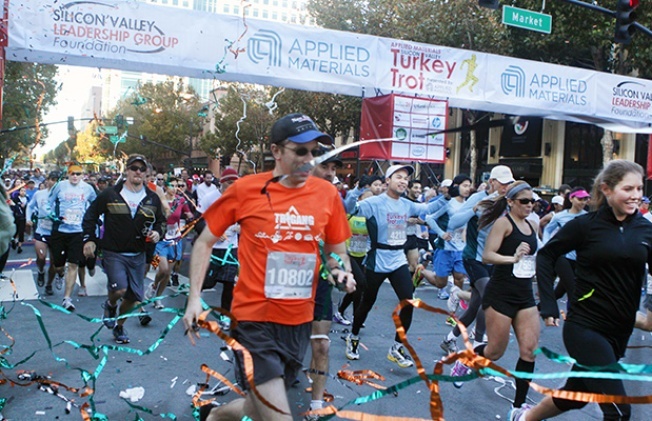 Start Thanksgiving Day off on the right foot at the Applied Materials “Silicon Valley Turkey Trot”. Before the big meal, the holiday parade and the pies, squeeze in some exercise running alongside thousands of locals! Join this year’s Turkey Trot and make it an annual tradition for you and your family. This new tradition will help the Healthier Kids Foundation of Santa Clara County, Housing Trust Silicon Valley, Second Harvest Food Bank, and The Health Trust. The Turkey Trot on November 26, 2015 allows the participant to choose from a 5K or 10K walk or run, along with a kids fun run. This event was founded and produced by the Silicon Valley Leadership Group Foundation. Onto it’s 11th year, this event has raised over $5 million to be given to local charities that support families in their most basic needs.